One of the most frequent questions I’ve answered concerning my book and blog is about the source of my inspiration. “Everywhere” as an answer is the slightly boring, *yawn*, yet it hits the nail on the head. Magazine pictures, market vendors, blog articles, TV shows and – most importantly – people talking about food in my everyday life including friends and family. Most recent example: Maike is the good fairy of my publishing house’s cooking portal Küchengötter (German). She had just returned from traveling and while we nibbled away on some chocolate bars and fresh red currants, she raved about a certain Mallorcan pastry she had enjoyed numerous times on her trip, called Ensaimadas. 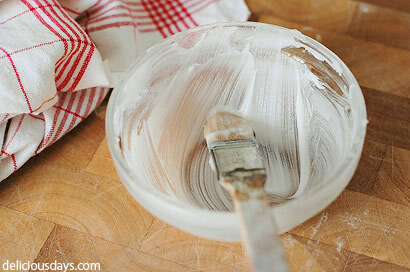 Being obsessed with all things yeasty (and lard! ), her description alone made me salivating: soft and flaky, slightly sweet pastry, made from long fermented yeast dough, lots of powdered sugar and greasy fingers from the used lard … ENSAIMADAS!!! – I quickly doodled down their name in my little to cook-notebook and added extra exclamation marks to make sure not to miss it. Back home, I scanned the baking as well as the Spanish section of our cookbook shelves, but neither Elisabeth Luard nor the recipes I found online could jump-start my endeavor. You know, the sort of impressive picture that just gets you on first sight or an inspiring, confident step-by-step description that sends you straight to the kitchen. Until I stumbled onto Eliza’s recipe (in German). Eliza and I have met before at a cooking class last year and have followed each others footsteps (aka recipes) closely. Her recipe had the right mixture of simplicity and details and before I knew, I entered my neighborhood bakery for a fresh yeast cube. Add the other ingredients (the remaining milk, eggs, olive oil) and knead well, either by hand or with your kitchen machine until the dough comes together nicely. I used less milk in the beginning (200 or 220 ml, while the original recipe suggests 250 ml) and my dough still turned out pretty sticky, I therefor added a tad more flour and let it knead at medium speed for 3 minutes (just for the record: my dough still felt sticky). Let the covered bowl rest again in a warm place for at least 30 minutes or until the dough has doubled. Preheat the oven to 200°C (~390° Fahrenheit) and bake for 14 to 16 minutes or until golden brown. Take out and let them cool down on a wire rack for a couple of minutes, then generously dust with powdered sugar and enjoy while still warm. Greasy fingers included! The way the dough curls at every turn is delightfully menacing. My knees go weak for sweet rolls and breads. And, the dusting of powdered sugar over these Ensaimadas is the clincher. I live in Spain and those ensaimadas looks more or less what we have here but maybe a bit less of dough and the crust seems a bit different but hey you did great!! it is difficult because you have regular ensaimada and the one from Mallorca which has a special filling in it called cabello de angel which I do not know how to translate. They are very, very soft in the inside and the crust is not very crispy. I'll try to find a good recipe for you and send it! So funny! Just this morning I was searching for Ensaimada recipes, because I had seen one example on the Yeast-spotting event on the Wild Yeast blog. However, no recipe really convinced me, just as you mentioned as well. And then I find this one! I'll certainly give it a try. I am also glad that you tried different rising times, as those very long ones sort of surprised me for a yeast dough. I was somewhat skeptical of that... 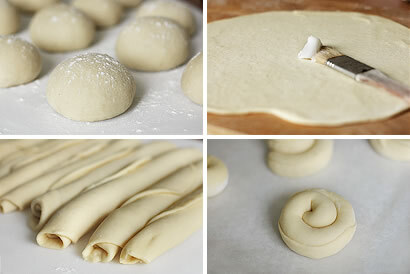 However, during my research, I found that Ensaimadas used to be made with a sourdough starter and I thought that the long rising times probably tried to imitate some of that taste. These look lovely. I am so interested in how recipes have regional differences (some minor, some major). It's fascinating to me. It speaks volumes about different cultures and countries. How people live. What they do. What they harvest. Love the look of these. Beautiful. That is beautifully flaky and tender! They look great. I've never eaten ensaimadas in Majorca, but have sampled many on mainland Spain, and they are argubaly my favorite pastry in the world. It wasn't until I watched an episode of a Rick Stein program on the BBC, that I discovered that they were made slathered in lard, and that only made me love them more. I think I need to head back to Spain soon, and find a nice litte cafe to have one for breakfast with the sweetest orange juice and strong cafe con leche. When i went to Majorca a few years ago I was really looking forward to try the "real" thing and was highly disappointed by the greasy, sugary thing that I got with my coffee and made me sick after the second bite. These look beautiful though. I will give ensaimadas a second chance, for sure! I have nevert tasted Ensaimadas but it sounds and looks great. Thanks for the recipe! do you eat (or at least try) all the delicious stuff yourselve? if yes, how do you manage to stay slim? Leider stehe ich mit Hefeteif ein wenig auf Kriegsfuß, alle Rezepte mit Hefe gehen bei mir schief. Ausdrucken werde ich es trotzdem, das sieht schon verdammt gut aus! i tried your recipe adding some slim apricot slices that i rolled up in the dough. LOVELY. the sour taste of the fruit goes really well with the pastry although they did look a little less perfectly shaped than yours! These look delicious! I love the idea of being inspired, and modifying the inspiration source to make a dish your own! A little help would be great here! This looks delish! Yum! I don't use pork lard. Any suggestions on the substitute? Loved the introduction for these ensaimadas! Thanks for providing a recipe. I'll definitely have to give them a try and hopefully they'll turn out as well for me as they did for you! I made the ensaimadas with softened butter instead of lard (you substitute equal parts of butter for the lard), and they were beautiful, very tasty. We have a huge sweet tooth, so my husband and I enjoyed them with small dabs of apricot jam, while they were still warm from the oven. Heavenly! I have to say, Nicky, I love all your yeast dough recipes, keep them coming! 40g of yeast? That seems like quite a lot...I can only find "loose" yeast (i.e., Red Star or Fleischmann's) that comes in 7g packets. Is your yeast cube equivalent? Thanks and your recipes are great! Hi Chris, I'd probably start with about 20 g of active dry yeast (half of the amount of fresh yeast the original recipe calls for). If you try them with active dry yeast, let me know! I have used this formula successfully many times. However, I also modified recipes slightly when using instant, because instant yeast has to be mixed with the flour, and not the liquid in the recipe. I made these ensaimadas today, the result is totally wonderful. I love the taste so much that I am planning to use the dough recipe for other type of breads as well. Ensaymadas, spelled with a "y", are very common and popular here in the Philippines. Neighborhood "panaderias" would prepare them topped with sugar and margarine straight out of the oven, ready to be sold early in the morning. 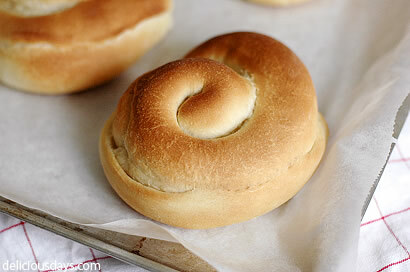 The ones sold in larger bakeries are prepared in a softer, lighter yet richer dough. They are filled with savory ham or sweet purple yam and topped with loads of grated cheese. I had them in Barcelona few years ago and LOVED them!! I had no idea that they had lard in them. Will definitely try this recipe soon!! I have wanted to make these since the day you posted this but put off getting pastry lard. I finally made them last night… I’m eager next time to try some different fillings… chocolate crème pâtissière? Apricot? I am totally with you: favorite sweet bread ever. Eep! I meant to include a picture. Here! 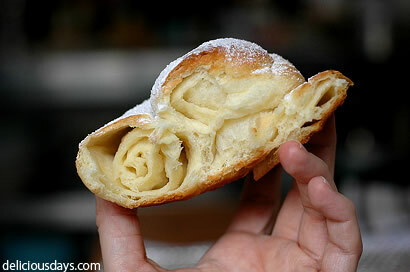 Have never tasted a Mallorcan ensaimada, but, have always enjoyed eating "ensaymadas" while growing up. Not sure how similar Filipino and Mallorcan ensaimadas are, but, the ones I grew up with are served with a dollop of some type of sweet cream and topped with shaved cheddar and/or edam cheese. Wow ensaimadas! One of my favorite desserts! We have a local version of that here in the Philippines and it is just as good. But it looks like your recipe looks more yummy. Thank you very much for posting this recipe. Hmm, ich liebe Hefegebäck... Gestern habe ich die Ensaimadas zum ersten Mal gebacken und muss sagen, dass sie mir heute, also am 2. Tag, fast noch besser geschmeckt haben als gestern warm aus dem Ofen. Das habe ich nicht oft bei Hefegebäck. Mein Fazit: Etwas aufwändig in der Herstellung, aber es lohnt sich. Against January: Cinnamon Rolls » victualized! wondering how they would turn out using butter in place of the lard? Made them 4-5 times already, soooo gooood! I'm a pastry chef in Seattle, USA who owns two Spanish/Basque restaurants. These look great and I will definitely try your recipe. Have eaten them in Spain many times but never made them myself. I have however made the "cabello de angel" which a previous comment mentioned. It literally means "angel hair" and is a preserve made from spaghetti squash, sugar, lemon and cinnamon which resembles orange marmalade in its orange glassyness. Very delicious! I was only once at Mallorca and had some really good Ensaimadas there together with some chilled almond milk( this is a lokal speciality as well).Does anybody know how this is made? So your picture looks a lot like what I want! Made these today with butter (about half the amount because that seemed enough) - they were delicious. Made half of the batch with cinnamon sugar on top of the butter - these were the best. The result reminded me a lot of "Faschingskrapfen" and I think I will try this recipe as a lower-fat version of these normally fried sweets during carneval. Thanks yet again for a great recipe! I made these today and they were de-li-cious. They grew so big after one hour, I don't know what they would have looked like if I had let them overnight. Next time I'll try 3 hours and see if they get even fluffier, though. I just realized I forgot the sugar on top but they were still reaaaaaaaaaaally good I had kids visiting and they couldn't stop eating them. A keeper, albeit a bit time-consuming. Didn't use the whole amount of lard, despite being generous with it. Next time 100 g will do. Thank you for this recipe! Hi, Thank you so much for this recipe. it is STRENUOUS and EXCELLENT. I used butter instead of pork lard and it was very good!